WHAT IS THE CRYSTALENS™ ? The first FDA-approved “accommodating” intraocular lens. The Crystalens™ by Bausch + Lomb automatically moves forward and backward with the eye’s internal focusing muscle to help patients focus naturally at all distances after cataract surgery. In conventional lens implant surgery, which has been the standard treatment for cataracts for many years, the surgeon implants a fixed focus plastic or silicone artificial lens. This lens allows the patient to see well only at distance. For reading or intermediate distance vision, patients would require a pair of eyeglasses to see. HOW WELL DOES THE CRYSTALENS™ WORK? In FDA clinical trials Crystalens patients enjoyed life-changing benefits. More than 98% of patients who received Crystalens implants in both eyes had uncorrected visual acuity of 20/30 or better at distance without glasses, and could read 6 point type on a medicine bottle. Also, 92% had distance visual acuity of 20/25 or better. In these studies 93.8% of patients surveyed said they could perform most daily activities without glasses. Glasses are not always eliminated, but they are required much less than with standard lens implants which make no attempt to give a range of good focus. The Crystalens™, is an advanced focusing implantable lens that helps you see clearly far away, at arms length, and up close, without being dependent on glasses or contact lenses. Enjoying life to the fullest means being able to see your surroundings at all distances, and that requires constantly changing focus. As we grow older, our ability to continually change focus begins to diminish as the normally clear and flexible lens in your eyes becomes rigid and hazy. Limited focusing ability means that you gradually lose the ability to see clearly, especially up close, without using reading glasses or bifocals. When you have cataract surgery you now have a choice of which lens implant to use in your eye. The standard lens will focus at only one distance requiring you to wear glasses for all other distances. When you choose the Crystalens™ you will have a better range of vision without glasses because the lens can change focus naturally. The Crystalens™ is implanted after the removal of the cataract lens using the same technique used in standard modern cataract surgery. Your surgery is performed on an outpatient basis, with eye drop anesthesia, and you can resume your normal work and recreational activities within a few days. Please schedule an appointment with Dr. Segal to see if the Crystalens™ is right for you. The Crystalens is an established technology by Bausch + Lomb that is designed to mimic the eye’s natural ability to focus on distant, middle, and near objects. Used in conjunction with standard cataract extraction methods, the Crystalens was designed to provide a continuous range of vision, from distance to intermediate to reading vision without total dependence on glasses or contact lenses. The Crystalens has the unique ability to focus on objects at varying distances using the eye’s natural focusing system. This means that the Crystalens can provide a continuous range of vision, without corrective lenses, from near to far and everything in between. Standard (single vision) lens implants do not have the ability to provide a full range of vision. Most people who have single vision lens implants MUST wear glasses for middle and near vision. It was shown in the two year clinical trial that supported the FDA approval of the Crystalens that significantly more patients implanted with a Crystalens (88%) could see better at all distances than patients implanted with a standard lens (36%). The Crystalens has been designed to focus your eyes at all distances after cataract surgery. While virtually everyone will experience a significant improvement in their uncorrected vision after surgery, some people will not see 20/20 at all distances. How well you see after surgery depends on the health of your eye. What is more exciting is that many of these people could pass their drivers test, 100% could see their computer and dashboard, read the prices in the supermarket or put on their makeup, and 98% could read the telephone book or newspaper, all without glasses or contact lenses. It is important to keep in mind that visual acuity is subjective and depends upon each individual’s own ocular and physiological conditions as well as lifestyle preferences. Some patients implanted with the Crystalens still require glasses for certain activities. WHAT ABOUT MY MIDDLE VISON, LIKE WORKING ON THE COMPUTER< WILL IT BE LIKE WEARING TRIFOCALS? Your ability to see at approximately arm’s length (middle vision) will be greatly enhanced with the Crystalens. Over 96% of people enrolled in the clinical study were able to see 20/20 at arm’s length without correction. In addition, the quality of vision compared to wearing trifocals is significantly improved. You will have a full range of vision, without having to tilt your head to find that portion of your glasses that allows you to see clearly. You simply look at something and the Crystalens will automatically focus your eye at near, arm’s length, or distance. The Crystalens mimics the natural focusing ability of your eye. HOW DO I KNOW IF I AM A GOOD CANDIDATE FOR CRYSTALENS IMPLANTATION? Dr. Segal will perform a thorough examination and advise you of a customized treatment plan for effectively correcting your vision. People who have had prior corneal refractive surgery are acceptable candidates for Crystalens implantation as long as their eye is in good health. Talk to your doctor. If you have already had cataract surgery, you are not a candidate for the Crystalens procedure. Typically cataracts will develop in both eyes. If only one eye has a cataract, only one implant is necessary. If both eyes have cataracts and the vision in one eye is worse, the surgeon will elect to implant that eye first. If both eyes are the same, the surgeon usually starts with the ‘non-dominant’ eye. The Crystalens procedure is typically performed in an outpatient surgical facility. You will arrive at the surgery center about an hour before the procedure. A number of topical drops will be placed in your eye and you may be administered medications to help you relax. The eye drops anesthetize your eye and dilate your pupil. Once in the surgery suite, you will lie down on a comfortable bed, a microscope will be positioned over your eye and you will be asked to look up into the light of the microscope. The actual surgery usually takes less than 20 minutes. Dr. Segal will stabilize your eye with a device to keep your eyelids open. Most Patients feel no pain, only slight pressure on your eye. All you have to do is relax and hold still. Once the surgery is complete, additional drops will be placed in your eye to prevent infection, decrease inflammation, and keep your pupil dilated. A patch may be placed over your eye and someone will need to drive you home. Once at home, you should rest for the remainder of the day. You should avoid any strenuous activities. Dr Segal will see you the day after surgery to remove the eye patch and examine your eye. Do not rub your eye. Dr. Segal will give you additional medications that you will need to put in your eye for the next Few weeks. These drugs help the eye heal. The contemporary treatment for cataracts is to remove the crystalline lens and replace it with an implantable lens. The Crystalens represents the state-of-the-art in implantable lens design and is the result of over 50 years of evolution in the treatment of cataracts. The medical procedure to implant the Crystalens is the same safe, proven cataract surgery performed annually on over 7 million eyes globally. Over 40 million procedures have been done in the last 25 years. But because it is surgery, it is not completely risk-free. Complications of cataract surgery range from minor, usually temporary side effects, to sight-threatening complications. Fortunately, significant sight-threatening complications are extremely rare. Current data indicates that 98% of people have no complications after cataract surgery and more than 95% have improved vision. Your Dr. Segal will perform a thorough examination and fully inform you of any increased risk of a complication. Your distance vision will usually be very good soon after surgery. However, your middle and near vision may be somewhat blurred at first. You may need to wear reading glasses to help you read during this time. After about 2 weeks, you will notice that your middle (arm’s length) vision is improving and your near vision is also starting to get better. It is important that you discontinue the use of the reading glasses at this time so that you strengthen the focusing muscle of your eyes. Everyone’s focusing ability is different. Most people will be able to see clearly in the distance, have excellent middle vision, and will be able to read a newspaper without glasses, but some people may be more comfortable with additional correction, particularly at night or in dim light. Your doctor will thoroughly discuss the restoration of your vision after surgery and will recommend a specific plan for optimizing your uncorrected vision for near and far. It is important to remember that while virtually everyone experiences much improved vision after cataract surgery, some people will have better uncorrected vision than others. It may be necessary for some people to wear glasses for distance and/or near vision to obtain optimal visual acuity. The difference from standard lenses is that most people will not be dependent on these supplemental vision aids to function normally. Since this information isn’t intended to replace the advice of a healthcare professional, be sure and talk with your doctor before making any decisions regarding vision correction procedures. WHAT CAN BE DONE IF MY IMPLANT DOES NOT PROVIDE SUFFICIENT FOCUSING POWER? There are various reasons why the power of your implant may not be sufficient to provide you with a continuous range of vision and Dr. Segal will discuss all options with you to give the best result. Yes. These symptoms can be produced or exacerbated by cataract surgery. Many people report these problems before cataract surgery and even after surgery; however, they are rarely debilitating and are no worse than with a standard lens. Sensitivity to light is often a temporary symptom. The Crystalens optic material is so clear that in some people it takes time to get used to how bright colors are and how intense lights can be, particularly at night. Your doctor will advise you as to how often your eyes need to be checked. Typically, the doctor will see you one day after surgery, one week and again at 6 weeks. Regular follow up visits after surgery ensure long term health of your eyes. Your surgeon and/or his/her staff will want to see you right after the surgery to ensure your eye is healing properly. This includes the 1st post-operative visit and usually the following visit. After that, the surgeon may allow you to see another qualified doctor to perform your follow-up visits. You should inform your surgeon if you would like a different doctor to follow-up with you after surgery so he/she can consult with that doctor to ensure a high level of care. You should immediately contact your surgeon if you have problems or any doubts about your eyes after surgery. The presence of an artificial lens does not make the eye any more vulnerable to trauma. Indeed, once the human lens has been replaced by the Crystalens, eye trauma will not cause a cataract. 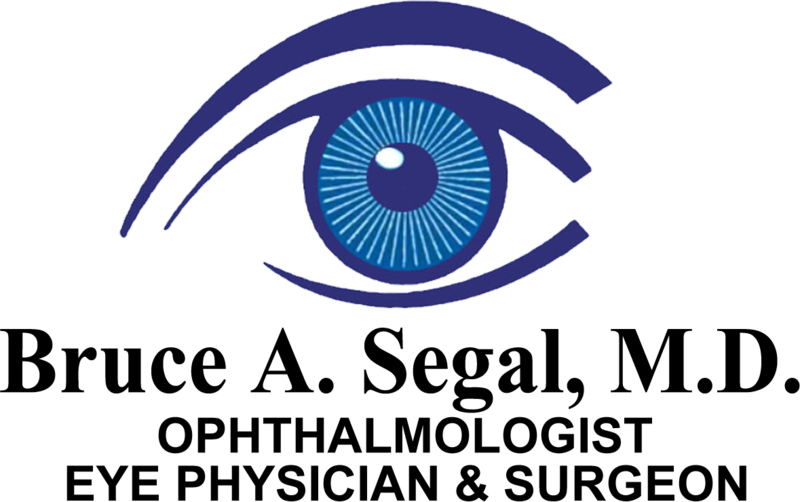 Advanced implantation techniques and the biocompatibility of the Crystalens allow the body to treat the implant as a normal part of the eye. 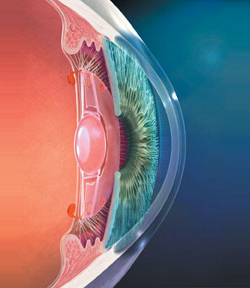 The implantable lens is encased in the original membrane that surrounded the crystalline lens. This membrane, called the capsular bag, traps and holds the Crystalens in the correct anatomical position in the eye. Since the implant is fixed in the same position as the original lens, any future eye surgery that could be performed in or around the normal eye can be performed in an eye with the Crystalens. Botox treatments, plastic surgery, pterygium removal, and other cosmetic procedures should not be performed until your eye is well healed. Typically, this is around 3 months, but Dr. Segal will advise you when it will be safe to undergo these procedures. I HAVE ROSACEA ON MY FACE. DO I NEED TO DO ANYTHING OR TAKE ANYTHING BEFORE THE SURGERY? DO I RUN A HIGHER RISK OF INFECTION AFTER SURGERY? Rosacea is not generally considered a contraindication for eye surgery unless symptoms are expressly related to the lids or the eye itself. Dr. Segal will perform a complete examination and if symptoms such as an infection of the eyelids, styes, eye irritation, and red eyes are present, he/she may elect to treat these conditions with medication before surgery. If you have rosacea and are not currently exhibiting significant symptoms, it is wise to inform your doctor of your condition. Implant surgery typically will have very little influence on chronic dry eyes. This condition is related to a variety of internal and external medical conditions and is sometime associated with aging. You should consult Dr. Segal on a therapy that is most suited to the cause and severity of your condition as well as your lifestyle. WILL THE CRYSTALENS IMPLANT INFLUENCE CHRONIC RED AND ITTITATED EYES OR HEADACHES FROM EYE STRAIN? If eye irritation is a result of excessive contact lens wear, sensitivity to cleaning and storage solutions, or what is generally described as ‘eye strain’, implant surgery may reduce or eliminate these symptoms. Eye irritation can be caused by a wide variety of internal and external factors including allergies that have nothing to do with the Crystalens implant. Consult your doctor for proper diagnosis and treatment of red, irritated eyes. WHAT WILL THE CRYSTALENS PROCEDURE CORST? WILL INSURANCE COVER ANY OR IT? Since each patient’s insurance and medical condition differ, the cost for eye surgery will vary. Insurance coverage varies greatly from policy to policy and state to state. Generally speaking, private insurance may cover the basic cataract surgical procedure and anesthesia and may also allow a certain additional amount for the artificial lens implant. The insured is then required to pay a deductible as well as any additional amount above the primary coverage. (Some patients are completely responsible for payment – not all insurance companies will cover some of the patient cost). Dr. Segal’s staff will review your insurance coverage and your surgical alternatives prior to your cataract surgery. It may also be beneficial for you to contact your insurance carrier. HOW DO I KNOW WHO IS A QUALIFIED CRYSTALENS IMPLANT SURGEON? All surgeons who are implanting the Crystalens have gone through extensive training and evaluation. Dr. Segal has performed thousands of cataract surgeries. Many surgeons have a webpage where you can learn about the doctor and the practice. There is no substitute for a face-to-face consultation with Dr. Segal prior to undergoing implant surgery. It is also very useful to contact patients who have the Crystalens implant in their eye. Ask Dr. Segal to refer you to several Crystalens patients. You can also contact your state medical society for information about a particular surgeon. HOW LONG WILL THE CRYSTALENS CONTINUE TO WORK? The Crystalens has been implanted in countless patients with great success. Since FDA approval was received in 2003, data continues to be collected that shows excellent visual outcomes with few reports of complications, including glare and halos.